Do you shop at Amazon? Did you know Amazon will donate 0.5% of your purchases value to Banchory Men’s Shed? You just need to use “Amazon Smile”. Or just go to smile.amazon.co.uk and select your chosen charity. First time through you will be asked to confirm your login details as normal, but after that if you always go to the Amazon Smile page (bookmark it) instead of your normal Amazon start page, then BMS will received 0.5% of your pre-VAT purchase price, or 1.5% for the offer fortnight. You will be asked whether you want to install the “Amazon Assistant” to “make the most of Amazon Smile”. We suggest you decline to install it unless you familiarise yourself first with its privacy aspects. We can vouch that the site works perfectly well without using “Amazon Assistant”. Once you have logged in via Amazon Smile, the rest of your shopping experience is identical with your normal Amazon shopping, just that you will also be helping us. 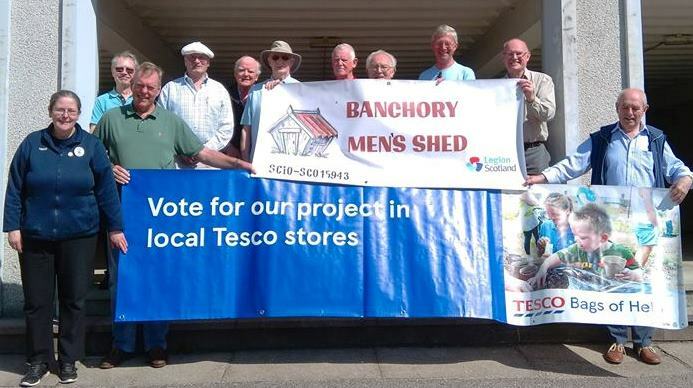 The Banchory Men’s Shed are currently enjoying “pole position” (that is, the box nearest the door) for the current round of the Tesco Bags of Help scheme. 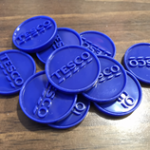 When you check out at Tesco don’t forget to see if you qualify for carrier bag tokens and if you want to support the Banchory Men’s Shed’s fundraising drive, please drop them in our compartment of the transparent boxes to the right of the out door. 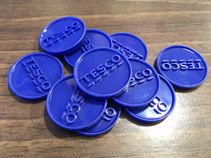 Our participation as a nominated Charity for this round of Bags of Help runs from 1st May to 30th June and we would love it if you would drop your blue tokens in our box. 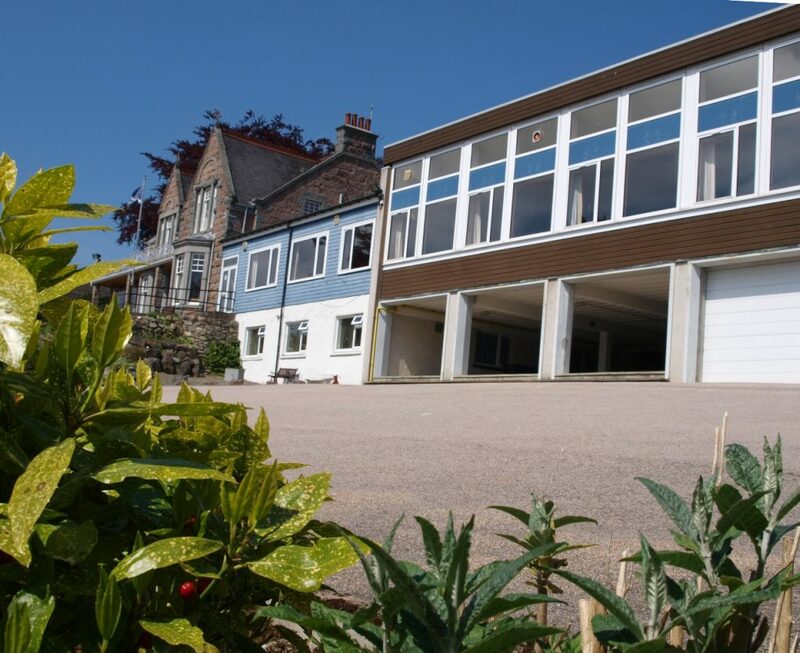 Depending on the level of support we should receive between £1000 and £4000 to put towards our fund raising efforts – we are intending to allocate these funds to Phase 2 of the premises. Thanks, and keep those tokens coming ! ….But definitely not the beginning of the end! Firstly, apologies for the lack of “Normal Service” hereabouts. We have not updated our web site for the last 5 months due to our Webmeister becoming seriously ill … in New Zealand … and hence being unable to travel back until recently. Hopefully normal service is now resumed, so keep your eyes open here. The Banchory Men’s Shed has been in existence now for 3 years, albeit without our own premises as yet. Much water has passed under the bridge and we have learned a lot about getting a Shed off the ground. As becomes necessary, the BMS Trustees/Board have to put themselves up for re-election every 3 years and this happened at the May AGM. Our outgoing board members Alan Pumfrey, Chairman, Peter Ash, Vice Chairman and Jack Ward, Secretary all decided not to seek re-election and the BMS conveys our thanks to these gentlemen for their excellent service in getting the BMS off the ground in the first place, continuing to support us through some difficult moments and to a point where the light at the end of the tunnel has indeed become visible. Alan, Peter and Jack are all remaining as BMS members; Alan and Jack are remaining as Trustees. Jack trying to keep up with the discussion! We have two new key Board members. Paul Evans has taken on the post of Chairman (as well as continuing with his superb fund-raising work) and Lionel Davis as Secretary. We welcome Paul and Lionel to the BMS board and look forward to working with them as we go forward into the rest of 2018 and further. The other Trustees were re-elected and are continuing their roles as per our Contacts page. As you may have noticed, we have now lost the banchorymensshed.wordpress.com site, which was free but included advertising (sorry! 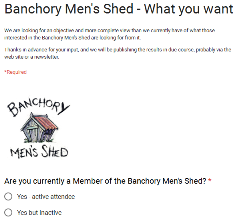 ), and had limited flexibility, so here we are now at banchorymensshed.org. This has been made possible through our new hoster providing a free (!) hosting package for registered charities, so many thanks and a “big up” are due to TSOhost. The old site will remain in place for a little while just to provide redirection but will eventually be taken down. This new website has been updated with a new BMS Who’s Who, an update to the timeline (Milestones), a new Membership Application Form to meet GDPR (the height of excitement!) and an updated list of Funding & Sponsors. For those of you who signed up on the previous Blog page to “Follow this Blog by e-mail” we have deleted all your e-mail addresses and have to reconsider whether we re-start this facility in the light of GDPR. Please also keep an eye on our Facebook page and our Twitter page for regular updates, and on this web site for the bigger picture. Not again! 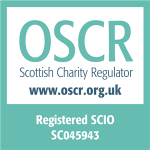 You will have been inundated with messages from anyone and everyone you have ever given your details to and you will be unsurprised to know that we have to join in with this game, even though small charities were exempted from data registration requirements before. The decision is made. 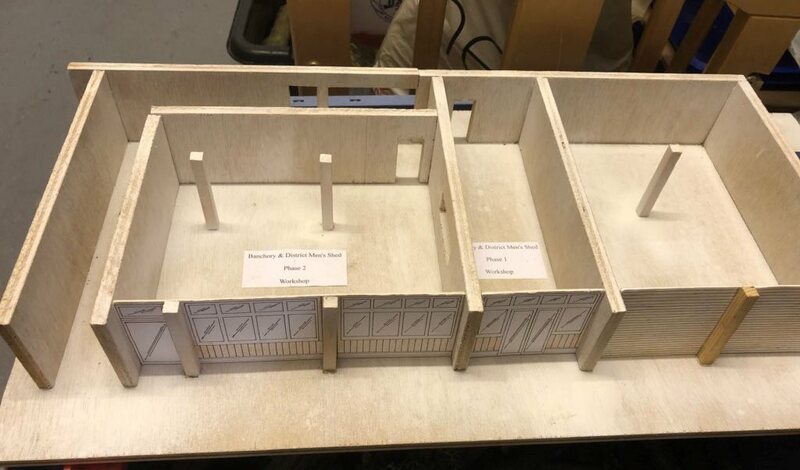 After a long assessment process (see here), the Banchory Men’s Shed have settled on our premises plans within the Legion Scotland at Ramsay Road. We are now moving forward with obtaining quotes for the work and with funding applications. We will be looking to convert the “downstairs” Garage Bay 1 to the Workshop facility first, as this is a moderate amount of work and cost, and during this time we will continue to hold our social meetings “upstairs” in the Legion. Once funding for the “Undercroft” (as it has become known) is secure then we will continue on to complete the original plan for a downstairs social and activities area. A big thanks are due to all who have helped us through this process. Do keep an eye on this news blog and our Facebook page to find out how things are progressing – once the building work proper is done, there will be opportunities to get stuck in to help with finishing and equipping the Workshop and Social areas, and our Men’s Shed will finally begin to resemble a … er …. Men’s Shed. Christmas that is. Had anyone noticed? No? You’ve not been shopping in department stores in Aberdeen, then? How do the staff put up with it? Each year? Though this blog has been quiet for a little while, this is due to frantic activity behind the scenes, not to a lack of activity. Things have been moving on in Banchory Men’s Shed particularly with the premises search, and following the Trustees meeting earlier this month we have some good news which we will be sharing shortly, once we have our behind-the-scenes ducks in a row. So, keep your ears open – or of course, come along on Tuesday mornings at 10:30 to the Legion to our Social, get the latest goings on and generally have a good blether. It’s noticeable that recent meetings have been well-attended as things become clearer and our collective mood brightens. 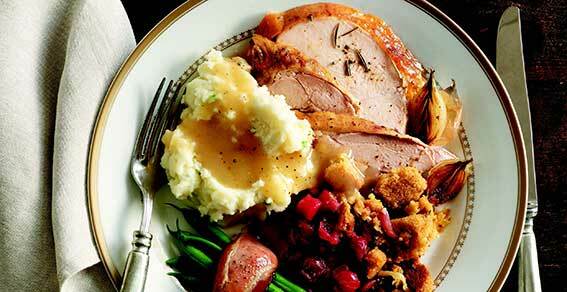 To that end, we also have our Banchory Men’s Shed Christmas Meal on Friday 8th December at the Legion, at 12:30. Numbers signed up as I write this are roughly half of our current membership. If you have not already booked (and most members should already have received a direct e-mail, but it’s not limited to existing members), then e-mail me at membership.bms@gmail.com to get the menu and to book. We need to get everything settled by the end of Tuesday’s Social, 5th December. Things with Scotland’s Men’s Sheds generally also continue to be pretty active. We attended the “Shire Sheds” meeting at Inverurie Shed a few weeks ago which was, as always, very informative and it was great to share experiences with sheds from: Alford, Banchory, Braemar, Dyce, Ellon, Inverurie, Keith, Peterhead, Stonehaven and alphabetically last but certainly not least, Westhill. (We clearly need Sheds in places beginning F, G, H…) It was encouraging to hear stories of both the difficulties with and successes that folk are making of their Sheds, so thanks to Inverurie for hosting that and we look forward to the next one at Dyce in mid 2018. Hopefully we will have all our news confirmed and under way by then. The Scottish Men’s Shed Association has a newsletter which I understand from Jason is going to become more frequent – you can download the latest edition from their website at scottishmsa.org.uk/ . The newsletters are under “Members” then “Resources”. Membership is free and you just need to sign up, after which you will get your newsletter automagically. Don’t forget, you can also receive updates to this blog via e-mail as soon as they appear. If you’re viewing on a computer, the link “Follow this blog by e-mail” will be to the right; if on a tablet or phone, the link will be at the foot of the page. Your e-mail address is secure and we do not use them for any purpose – don’t use them at all, in fact. Anyway, until next time, or until seeing you at our Socials or the Christmas Meal, have a great time. In today’s BMS monthly meeting we agreed to issue a Survey to find out more about our members and what you want in a Men’s Shed. The responses will help us understand our membership better, what you want in a “Shed”, where you want it to be, what your priorities are. We would be delighted if you could find the short amount of time needed to fill in the survey and promise that the information will be put to good use. Depending on how we need to present the results, we intend to ultimately publish the results, either via our web site or perhaps a Newsletter, but the information will definitely be available via our social and business meetings. Indeed, publication may take some time to gather sufficient responses, but the interim picture will be available via our meetings as it builds. The survey is anonymous, though you can input your e-mail address at the end if you want, so we can contact you. Anyone can use the link, there is no login or sign-up required. If you would prefer to complete a paper copy, then please contact the BMS membersip e-mail given on the Contact page and we will send you one.